Where we got it: It was a shower gift, a brilliant gift. 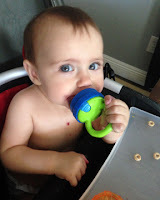 What it's for: You put food in it for baby to chew on, and they get to experience the taste (and the teething relief) but they won't choke on the food! Why I love it: Penny has used it for apples, pears, cucumber, frozen blueberries (GREAT for teething, watch out they stain), you name it. It gives her control over her eating experience and I don't have to worry about her choking. It also keeps Penny occupied and happy so I can get something done! Where we got it: A gift, registered for on Amazon. What it is: A portable activity center that folds like a camping chair. Why I love it: Unlike bouncers and saucers and other big bulky gadgets, this thing folds up and can go with you anywhere (including through standard doorways within your house). It's really well made and I use it in the house, on the porch, camping, up at the cabin... A great thing to have. What it is: A chewable necklace that's safe for baby and looks great on mama. Why I love it: It keeps Penny busy while I'm holding her or nursing her, especially in public. She can't drop it (because it's attached to me) and I also think it's super cute! I have a red one but they come in tons of colors and styles. Oh, also, you can just wash it in the sink... super easy. 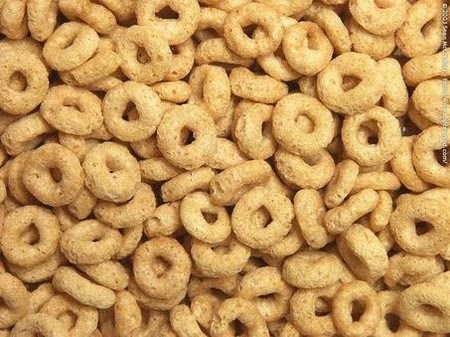 Why I love it: I introduced Penny to Cheerios the same way my mom introduced me to cheerios... around the edge of the coffee table to practice her cruising, keep her busy, and give her a little snack. I feel safe with her eating Cheerios even at this age because they have a hole in them so even if one were to go to the back of her sweet little throat (which it hasn't yet) she could still breathe... plus they are very gummable and dissolve pretty quickly. The dogs love them too which means I don't have to clean up... An affordable alternative to the trendy "puffs" that all the cool babies like (which we also have in the house, but use as a novelty). Maybe Penny likes them so much because I ate them like CRAZY throughout my pregnancy, I craved them probably five times a week when she was growing in my belly! 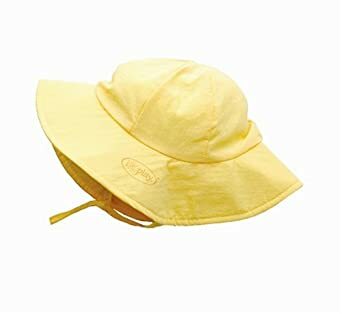 The Product: Sun hat by iPlay. 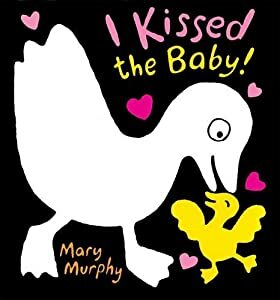 Where we got it: Amazon, I saw a fellow new-mama's daughter wearing the same one in a Facebook photo and asked her where she got it -- so glad I did. What it is: a hat. Why it's a must: Especially in Arizona, but really anywhere you're gonna have baby outside, you gotta protect that sweet face and eyes from the beaming sun. And at 6+ months, baby wants to be outside, a lot. The under-chin tie is key, and this one is also light-weight and easy to wash and does well in the pool. 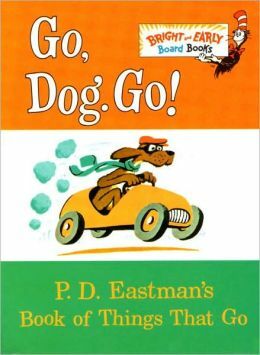 Go Dogs Go, the board book version; and I Kissed The Baby. Baby Bullet. I would have included this in my top five, but I already wrote a pretty extensive product review of this baby food system here. Video monitor. We moved her to her own bedroom right around 6 months.... and it's soooo farrrrrrrrr from our room! I love being able to look at her while she's sleeping. We like ours by Summer Infant. Kitchen containers of all kinds (Water bottles, tupperware, plastic pitchers, big movie cups, red cups, small cups, pots, you get the idea...). Sometimes all the coolest toys in the world just don't compare to the stuff you already have in the house.